Pais Bas Catoliques Connues sous le nom de Flandre. 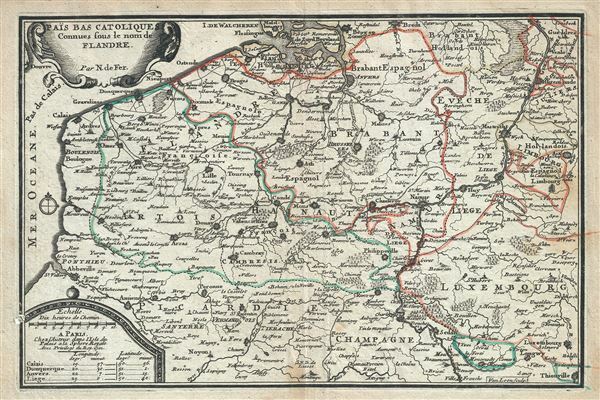 This is an attractive 1701 map of Flanders by Nicholas De Fer. The map depicts modern day Belgium and Luxemburg along with parts of Germany, France and Holland, a region commonly called Flanders at the time. It covers from Breda south as far as Thionville and from Boulogne eastward to Aachen. Includes the regions of Flanders, Artois, Picardie, Champagne, Liege, Brabant, Limburg, Hainault, Luxemburg and Juliers. The entire region is rendered in extraordinary detail, offering topographical and political information. This map was made after the end of the Eighty Years' War (1568-1648) when the Low Countries were divided into the United Provinces and Southern Netherland, of which Luxembourg became part of. This portion of the Netherlands was known successively as the Habsburg Netherlands, the Spanish Netherlands, and the Austrian Netherlands, until, in 1795, Napoleonic forces invaded and set up a new French client state, the Batavian Republic. The Low Countries, until 1581 part of the Seventeen United Provinces, were reunited by the 1815 Congress of Vienna as the United Kingdom of the Netherlands. br> All in all, a very interesting and attractive map of Belgium to appear in the beginning of the 18th century. This map was engraved by Harmanus van Loon and created by Nicholas De Fer for his 1701 Atlas. Very good. Minor wear along original centerfold. Original platemark visible. Minor spotting. Verso repair over left margin and border near scale.